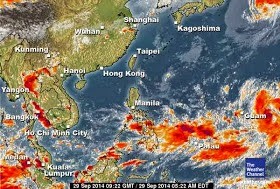 Typhoon - Bagyong Neneng to enter Philippines this week October 5, 2014. Bagyong Neneng has 45kph wind but it's still too far from the Philippines. According to PAGASA that typhoon Neneng may still intensifies as it travels in water. Typhoon Neneng is already a tropical depression. Typhoon Neneng Updates October 2014.